Panasonic Lumix DMC TZ1 digital camera is dubbed as the world’s smallest 10x optical zoom lens digital camera by Panasonic. Panasonic Lumix DMC TZ1 features 10x optical zoom LEICA DC lens, extra optical zoom (extended optical zoom) that extends the zoom ratio to 12.5x, dual image stabilization with MEGA O.I.S. plus high sensitivity of ISO 800, Venus Engine III enables quick response and high quality image output yet dramatically reduces noise levels, 2.5″ LCD monitor with High Angle Mode, Mode Dial or Scene Mode that includes Simple Mode, Baby Portraits, Night Scenes, Beach Mode, Aerial Mode, Underwater Mode and etc, ISO 800 shooting at full resolution, faster auto focus and various handy functions for traveling. ComputerAct!ve (dead link) reviews Panasonic Lumix DMC TZ1 and concludes with overall rating of 4 out of 5 that the DMC-TZ1 is an ideal product for those who need a big zoom but don’t want to lug around a bulkier or more expensive camera, don’t need a huge resolution and aren’t desperate to have a product that conforms to the latest slim line fashion. Dual lenses in a sophisticated body design add up to a 10x zoom capability. HardwareZone concludes that as per camera from the Lumix series, colors from the TZ1 were brilliant and color accuracy was spot on. Buttons are all within easy access and user interface is simple enough to make short work of making fine adjustments in a haste. For its hosts of automatic modes, powerful 10x optical zoom, high ISO sensitivity and improved Venus Engine III, the TZ1 is easily a traveler’s best imaging companion. However, seasoned photographers might find its lack of manual controls too limiting, even if the combination of 10x optical and ISO 1600 does make it an enticing proposition that is too attractive to ignore. DigiCamReview recommends Panasonic Lumix DMC-TZ1 with commets that Panasonic Lumix DMC-TZ1 is a very good all round digital camera, compact and pocketable (in large pockets) yet features a Leica 10x optical zoom lens with image stabilization. The camera produces very good images with excellent color, saturation and exposure, assuming you use the lowest ISO settings. Purple fringing was slightly higher than average and was noticeable in flash reflections on when using the full 10x optical zoom but isn’t a huge problem. If you want to record videos then this camera has a very good high resolution wide-aspect ratio video mode. The camera is very easy to use (in auto mode), and would definitely suit a beginner. The camera offers good battery life, with good controls, good build quality and quick performance. 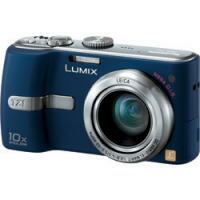 To finish things off, the Panasonic Lumix TZ1 is good value for money and therefore Recommended!